Are you looking for good pots and pans for gas stoves? This here is your definitive guide to buying the best cookware for gas stoves. Overstating the importance of cookware is hard. After all, unless you’re a takeout fiend, chances are you use it at least once a day. There are many cookware sets out there that can fit just about every budget, but not all of them are good. That’s why we brought you this list so that you can choose the best cookware for gas stoves or a the best pan for gas stoves. Ask anyone who has owned a single pan for a while. 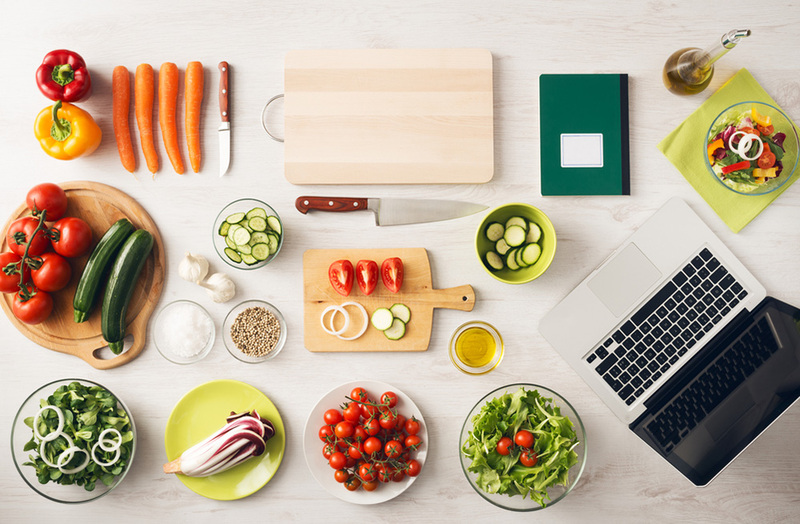 Trying to cook delicious and healthy meals more than once a day can be pretty challenging if you only own a single cooking surface and it’s even more difficult when you own cheap cookware…but why? Well, to better understand why cheap cookware isn’t cheap in the long run, you need to learn about what attributes to look for when it comes to kitchenware. Simply put, some pots and pans will have chemical reactions when they come in contact with certain kinds of foods. This isn’t to say that some materials are unsafe to use but rather that there are certain things you can’t cook on them. A good example of this is tomatoes, which when cooked in a copper pan will dissolve and discolor, turning them from ripe and delicious tomatoes into an unappetizing mush. Reactive materials include copper, steel, iron and aluminum. Non-reactive materials include ceramic and stainless steel. In short, heat conduction describes just how fast heat is transferred from the burners to the food. Some materials are more conductive than others. Copper pans, example, is the best conductor out there and is closely followed by aluminum and stainless steel. Ceramic cookware, on the other hand, might take longer to show temperature changes. High-quality cookware will often take both things into consideration, working towards finding the balance between reactivity and heat conduction to give you kitchenware that heats up and cooks fast without altering your food in undesired ways. We mentioned how getting quality cookware was possible without breaking the bank, and this is a good example of it. While pricey, it’s still affordable, and you’ll get a lot from your investment. We all know that Cuisinart makes quality products and stands by them. This cookware is oven compatible and dishwasher safe, making them a great addition to your kitchen. It includes skillets, sautés pans, stockpots, and a very useful steamer insert, which gives it some extra value. Perhaps the best thing about this set is its sturdiness, as this cookware set can be used repeatedly without discoloration or food sticking. Of course, this is assuming you know how to clean and care for stainless steel cookware as otherwise, you might have some problems keeping this set clean. 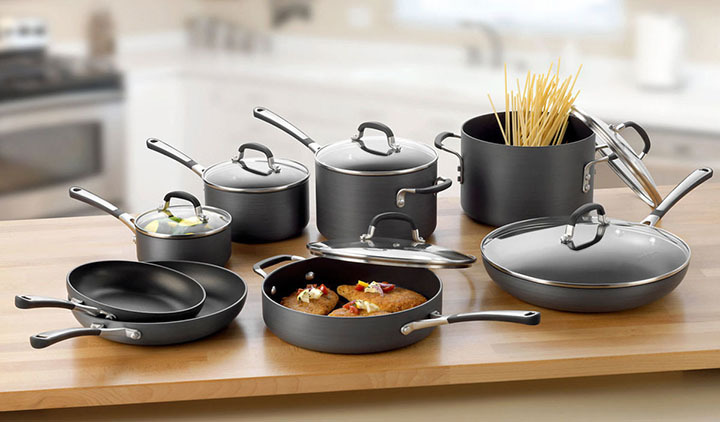 If you’re looking for cookware that cooks great and looks great this is the set for you. Not only is it beautiful but it comes in a variety of colors to ensure it fits your kitchen no matter the style. Better yet, this cookware set is as useful as it is beautiful as it comes with sauté pans, skillets, and saucepans capable of fulfilling your every cooking need. This set is ceramic coated with an aluminum based so you’ll avoid even the smallest risk of reactivity while enjoying the benefits of fast heat conductivity and, if that isn’t enough, you’ll also enjoy the non-stick properties of ceramic. This is the second stainless-steel cookware set included in this list and if you paid attention to the previous article you’ll know why. Not only is this material very conductive but it’s also non-reactive so it makes for an excellent choice when you’re looking for the kind of cookware that can do it all. This 18/10 stainless steel cookware set is very varied, comes with an assortment of pots and pans, including saucepans, sauté pans and even a steamer insert. Not only that but it’s very solidly built, easy to clean, dishwasher safe and can even be used in the oven. This is a complete cookware set that’s sure to fulfill most cooking needs the average person might have. It even includes a steamer insert, which makes it even better. This is a very sturdy base with an aluminum base that, as we’ve learned, spreads heat quickly and evenly, making temperature control that much easier. Its ceramic coat is also non-reactive which means your food won’t have any discoloration or any other unexpected results. Plus, it’s also nonstick so not only does your food slides right off, ensuring the perfect look, but they also clean very easily. If that isn’t enough, this cookware is also dishwasher and oven safe, giving it some extra value you should consider. This is another great option for those looking to reduce their exposure to the toxic chemicals often found in Teflon coated non-stick cookware. This kitchenware heats and cools down fast, cleans up very easily and is even dishwasher friendly. Not only that but it can safely be used in the oven which means you’ll find plenty of reasons to try new recipes. Another good selling point is the price, as this is one of the best cookware for gas stoves that is most affordable items in this list. WHAT'S THE BEST COOKWARE FOR GAS STOVES? the winner! It has plenty of accessories and a good variety of pots and pans. ​Stainless steel is sanitary so they are easy to clean. ​Dishwasher safe, unlike most non-stick pans. The pans are well balanced and not too heavy. Consider what you cook when it comes to buying cookware. Some sets are enormous and include all kinds of attachments and accessories you might not even need. If all you need is a simple cookware kit with two pans and a pot, then that’s all you should get. Likewise, consider what you do the most. If you sauté, then you should focus on heat conductivity, if you braise, then you want to concentrate on the size and positioning of the heating elements, if you make a lot of sauces, then non-reactive elements are essential, etc. Looks? Who cares? Sometimes the biggest selling point of a cookware set is how good it looks. Don’t worry about matching sets if your pocket doesn’t allow it. If it’s easier to buy pan by pan until you have all the things you need, then do it. What matters is the food, not the looks of the things you used to cook it. Imperfect doesn’t mean unusable. Sometimes high-quality brands will sell their pots and pans at a lower price if they’re not 100% perfect. This can mean a small scratch, a slightly smaller handle or an obvious variation of color. Some of the ‘defects’ are so small they won’t have any impact on your food so if you don’t mind the slight imperfections you can get excellent cookware at a low price! Always a classic, T-fal brings to the table a beautiful fry pan that’s perfect for all kinds of stoves but really shines when used on traditional gas stoves. Measuring 12.5 inches, it has more than enough space to cook just about anything and its trademarked Teflon surface ensures that nothing sticks to it, particularly if you decide to season it to double its non-stick properties. With a long and comfortable handle that stays cool to the touch, this is a very easy pan to use. However, it’s worth mentioning that it isn’t perfectly flat, which means the food has the tendency to move to the sides of the pan; Not a deal breaker, by any means, but something you should be aware of. Design wise, you’ll be satisfied to know that this is a reliable and quite straightforward pan. It’s well built and sturdy, capable of withstanding constant use without any problem. The only real problem are the rivets that hold the pan and the handle together, as these tend to get quite dirty and cleaning them is hard. While this pan is advertised as being safe to use with metal utensils and being scratch resistant, it doesn’t deliver in any of those areas. Truth is, as with any other Teflon based non-stick pan, you should never use any metal utensils and this one is no different. It does deliver wonderfully in the oven safe and dishwasher safe promises, though, so we can’t fault the manufacturer for feeling a little overconfident about their product. Overall a reliable and affordable pan that’s perfect for those of you with a small budget. For better results, wash by hand and never use metal utensils on it. Available in different measurements, from 3.5” to a whooping 15”, this is the perfect option for those of you looking for an affordable, sturdy skillet that performs like a dream on gas stoves. Capable of cooking just about anything, this skillet has the potential of becoming non-stick with time and it’s oven safe, dishwasher safe and even freezer safe, as long as you keep it away from harsh temperature changes. As it’s customary for cast iron cookware, this one is quite heavy and not at all easy to move around and play with, particularly once it’s full of food. Still, it comes with a hoop handle that makes transport, and storage, easy. While perfect for conventional gas stoves, it can also be used outside, granting you the ability to be the star of the next BBQ you go to. Cat iron pans get very, very hot, which is why this one comes with the option of purchasing a handle holder, which we highly encourage you to acquire. If you already own one, then no problem, you can get the pan without it. The handles get very hot. Hot enough to injure if you’re not careful. If what you want is a pan that looks as good as it performs, this one is perfect for you. Available in three different sizes and three different colors, each of them as attractive as the other one, this is a perfect option for those of you interested in cooking without APEO, PFOA and other chemicals. While chemical free, the cooking surface is still non-stick, thanks to the materials used to creating it. The coating is advertised as scratch-resistant, but it’s still quite easy to scratch if you’re using metal utensils. Perfect for gas stoves, it nevertheless performs well on electric and induction stoves as well. The reinforced silicone handle stays cool to the touch at all times and is attached to the pan by tree smooth rivets that are as easy to clean as the rest of the pan and the perfectly flat bottoms ensures that your food stays where you put it, which is a particularly useful trait if you plan on cooking liquids. - Only use it with medium or low heat. A wonderful skillet that can be used both casually or professionally, this is the kind of pan you get when performance is your upmost priority. Made with high quality stainless steel, this beautiful pan is as non-stick as it gets once properly seasoned and it’s very, very easy to clean. Since steel is such a good conductor, the pan heats up evenly and quickly, even though the pan has a lot more depth compared to regular pans. This, coupled with the fact that the pan comes with a glass lid, makes it even more versatile than most as you’ll be able to cook a variety of foods with it. While the handle may look too thin for the pan, it’s actually quite sturdy and, best of all, it stays cool pretty much the entire time. Unless, that is, you choose to use this pan in the oven. That’s right, this stainless steel pan also works in the oven, making it perfect for those of you trying to get the most bang for their buck. Not everything is perfect about this pan, though, since it’s rather easy to dent and, like any other stainless steel pans, there’s a small learning curve to it. Particularly if you’ve never used stainless steel pans before. Last, but not least, this is a rather heavy skillet, weighing roughly 6 pounds without food. A peculiar entrance to this list, no doubt, but one that’s perfect for those of you who live in small apartments, homes or even tiny houses and have to be strict about storage space, the Cleverona is a fry pan with a detachable handle that works well on all kinds of stoves. Due to its peculiar shape and characteristics, this pan can be used as a wok, a casserole, a sauce pan and even a baking pan, since it’s oven safe to booth. It’s not the largest pan out there, but that’s part of the charm, as you’ll never run out of storage space with this pan. It has excellent non-stick properties, though the material used to achieve this is similar to Teflon, and if you’re worried about the detachable handle giving away when you’re cooking, don’t worry. It’s quite sturdy and it will withstand heavy use for a while. As with other non-stick cookware, you should never use metal utensils on the Cleverona, but unlike similar pans, you can actually use this in the dishwasher. In fact, it’s encouraged, since the removable handle makes it possible. Now that you know what to look for it’s time for you to understand why certain brands of cookware are more expensive than others. To achieve a good balance between conductivity and reactivity, some brands merge two or more metals. They might use ceramic for the cooking surface, so it doesn’t react with your food, but they might line the bottom with copper, so it heats up and cools down much faster. Others might want the non-stick properties of stainless steel with the heat conductivity of aluminum so mixing both metals is a no brainer. In the previous examples, the heating elements are copper and aluminum respectively. This is the material that goes on the bottom of the pan or pot and is responsible for heating up your food. 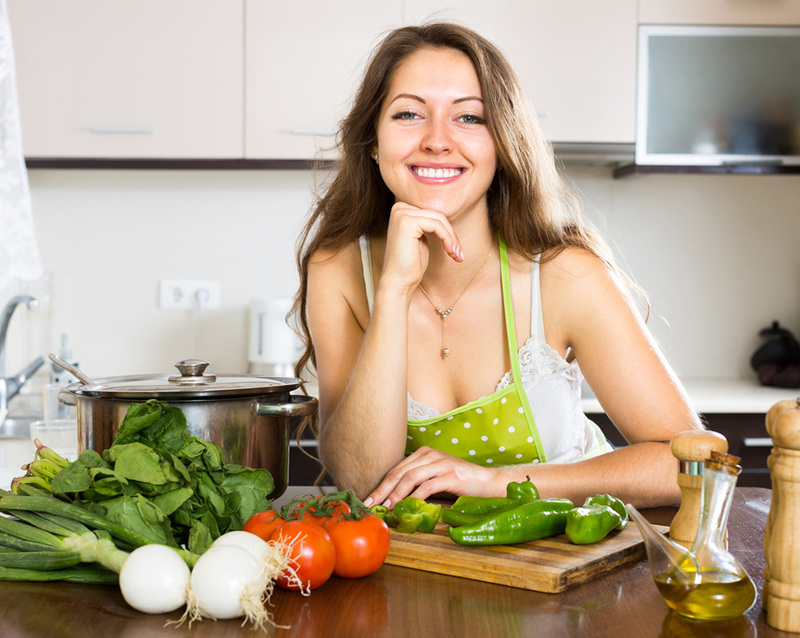 Cheap cookware will often have a small heating element placed in the middle which means the pan will be the hottest in the center which can lead to uneven cooking. More expensive options will often have heating elements covering the entire bottom or even the sides of the pan ensuring a more through the cooking of your food. Simply put, more expensive cookware is built better. Things such as “cool touch handles” that ensure the handles stay cold no matter what, a better overall balance to ensure the cookware doesn’t rock, resistant materials that won’t be damaged by scratching or accidents, nonstick properties that make cleaning them easier… you name it. We went through the best set: Cuisinart's MCP-12N Multiclad Pro and we really like the Utopia Kitchen's stainless steel skillet for best pan. We hope this helped! Please leave us a comment! What do you think is the best cookware for gas stoves? You may also enjoy reading: Best cookware for glass top stoves and Best Copper Pans. Your article was so helpful to us! Being my husband and I have been married 59 years doesn’t exactly make us spring chickens and we find our favorite cast iron cookware so heavy to lift and move around. We found our wedding set that we were given made of copper and stainless and then remembered what you wrote about quick heat transfer. We’re going back to it and passing our heavy iron to our kids and grandkids. We’re tired of hauling that around, especially since we’re in the middle of another house move! Hopefully our last. We really appreciate the information on the varied cookware. Thank you. Thank you so much for reading, Judie! I am so happy you found the article helpful. Also, good for you for passing on the cast iron pans- it is so sad when people get rid of them because they are so well-seasoned and last forever. Good luck with the move! Thanks for your comment!